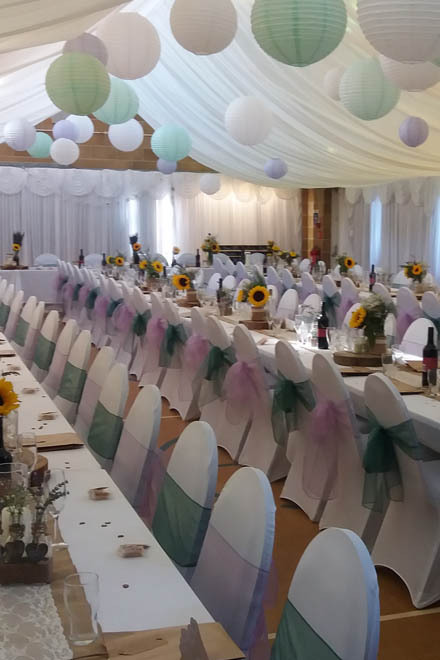 Winterslow Village Hall is an ideal location for your wedding reception. It is located in the beautiful Wiltshire countryside with easy access from surrounding towns. Our Main hall can accommodate 129 guests sitting down to a meal. Exclusive use of the Main Hall, Meeting Room, Recreation Room and kitchen from 6.30 pm until 10.30 pm on the day before your wedding to allow time for setting-up (extra time can be added), from 9 am until midnight on the Saturday and from 8.30 am until 10.30 am on the Sunday for clearing and cleaning the hall. Our PA system with connection facilities for computers, laptops and iPods. And the price for our Wedding Package? Wonderful Wedding Receptions with Style!